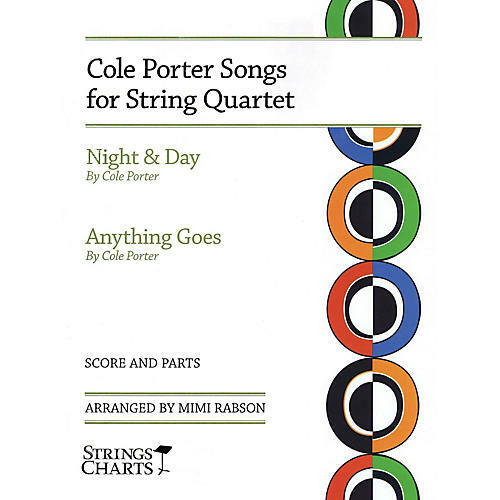 Take your ensemble back to the 1930s with these lively Cole Porter show tunes arranged for string quartet. Written in 1934 as the title song for his Depression-era Broadway musical, Anything Goes has a distinctive rhythmic motif and a playful style that is so characteristic of his music. It's perfect for weddings, Valentine's Day, and other casual gigs or as an unexpected encore piece. Night and Day is a timeless ballad and jazz standard, arranged here as a concert piece, that's been recorded by Billie Holiday, Ella Fitzgerald, Frank Sinatra, Ringo Starr, U2, and many others. Save the unabashed sentiment of these romantic pieces.